This was supposed to be a battle between the conference leaders, a possible preview of what could be the Stanley Cup final in a few months. 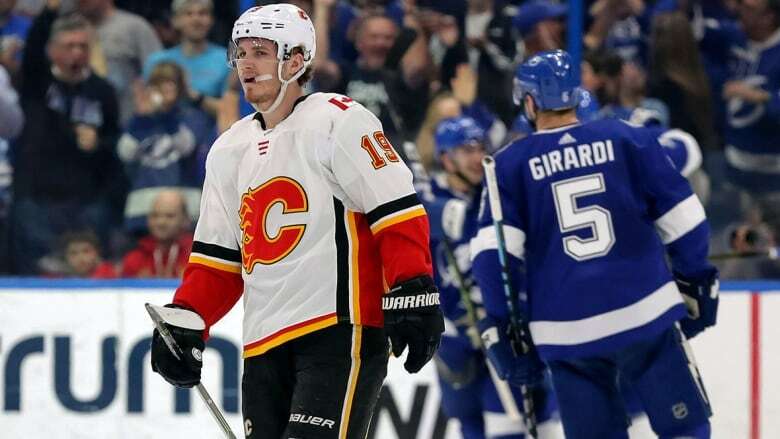 But the Calgary Flames were outclassed by the Tampa Bay Lightning on Tuesday, casting doubt for a possible matchup in June. The latest clash between the Calgary Flames and the league-leading Tampa Bay Lightning was cruel to the visitors. Unlike the previous meeting in Calgary on Dec. 20, when the teams put on an offensive clinic that resulted in a 5-4 shootout win for Tampa Bay, the rematch was a one-sided affair in favour of the Lightning in its 6-3 victory on Tuesday. This was supposed to be a battle royale between the conference leaders, a possible preview of what could be the Stanley Cup final in a few months. But the Flames were knocked out of the top spot in the West by the surging San Jose Sharks on Monday and passed by the Winnipeg Jets on Tuesday. Calgary now has now lost three in a row and maybe the Flames are not the Stanley Cup contender they thought they were after a 12-2-2 post-Christmas run pushed them in first place in the West. The Lightning, meanwhile, is the class of the league and frontrunner to win its first championship since 2003-04. It has a 13-point lead in the Presidents' Trophy race over the Jets and Sharks with 25 regular-season games remaining. Winning the Presidents' Trophy should be given more prominence that it has received in the past. It takes a brilliant display to come out on top over 82 games, while there always is some luck involved in the Stanley Cup playoffs because health and a hot goaltender are important factors in the four-round tournament. Tampa Bay has been a model of consistency this season. The Lightning has reeled off win streaks as long as eight and seven games, respectively. It has the best record at home and on the road. It has been the highest-scoring team, the best power play, second most efficient penalty-killing unit and sits sixth in goals against. With the exception of a few youngsters sprinkled into the lineup, like Brayden Point, Anthony Cirelli and Adam Erne, this group has been together for some time now and made runs to the 2014-15 Stanley Cup final and trips to two of the last three Eastern Conference finals. The Flames are a relatively new group. Sure, the nucleus of captain Mark Giordano, Johnny Gaudreau and Sean Monahan has been together for five seasons. But there were a lot of additions to the roster this season. A big trade with the Carolina Hurricanes landed Elias Lindholm and Noah Hanifin. Free agents James Neal, Derek Ryan and Austin Czarnik, who finished third in the AHL scoring race last year, were signed. Rasmus Andersson became a regular on the blue-line. There also was a new head coach in Bill Peters as well as additions to his staff in Geoff Ward, a Stanley Cup winner with the 2010-11 Boston Bruins, and Ryan Huska. The Flames may well finish strong and finish in first place in the West. After all, they are only one point behind the Jets and Sharks and have a game in hand on both teams. If Calgary does finish atop the Western Conference and Lightning hold its place in the East, the two combatants from Tuesday evening could meet again in the Stanley Cup final. If so, it only will be the third time the regular-season conference winners have met in the championship series since NHL commissioner Gary Bettman cancelled the 2004-05 season because of a lockout. The other two occasions were when the Chicago Blackhawks upended the Bruins in six games in 2013, and when Boston beat the Vancouver Canucks in Game 7 in the 2010-11 final. While the high-flying Lightning appear to be a team destined to make it back to the final this spring, the Flames will have a more difficult path in the West. The Sharks have been one of the hottest teams, going 22-6-2 since Erik Karlsson made his return to Ottawa on Dec. 1. The Jets and Vegas Golden Knights proved last year that they have teams built for playoff success and the Nashville Predators have a deep lineup that was in the final two years ago. The Flames still have plenty of time to build on their successful four-plus month start. But as they found out on Tuesday, the Lightning can be cruel to opponents and is a club that is championship ready.